1、Input voltage : AC 100V-250V. The input Voltage is the same as the testing Voltage. If test T8 fluorescent tube with the Magnetic ballast inside the tester, the input voltage should be AC 200V-250V,50Hz. If test LED lamp or other lamps without ballast inside the meter, the input voltage should be AC 100V-250V. 50-60Hz. 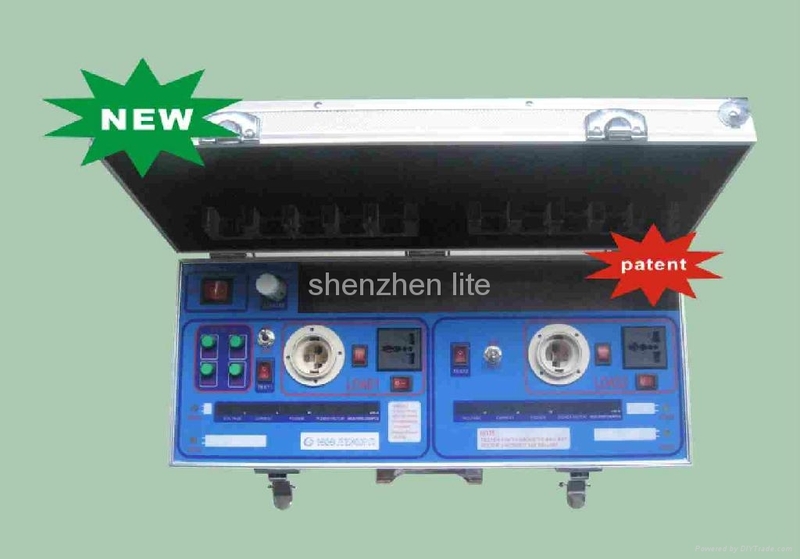 2、 It could test not only the lighting products but also the other electrical products with Voltage range 100V-250V. 3、 Maximum testing wattage: 300W. 4、Testing parameters: Voltage, Current , Power, Power factor, Annual power consumption. (Calculated based on 10 hours/day). 5、It could test two pieces different electrical products at the same time. 6、TEST1 with magnetic ballast inside could test T8 fluorescent tubes of 20W(60cm),30W(90cm),36W(120cm) and 58W(150cm).TEST2 is without any ballast inside could test different size and wattage of LED tubes or T8-T5 fluorescent adaptors..
7、 LOAD1 and LOAD2 have E27 base and multi-use sockets. It could test any bulbs or electrical products with power plug, and no need to connect the wire in additional. 9、With terminal holders, it could test any electrical products with wire. 10、With fuse inside the power sockets, it could protect the over load short circuit. 11、Compact size, small volume, very light , convenient to carry.